« Dangerous lessons in cath lab :How to convert a coronary guidewire into a cutting wire ? Wrap around LAD : Is it an Advantage or Disadvantage ? Type 3 : Wraps around LV apex and travels some distance in the posterior Inter-ventricular groove. As the name implies , LAD should descend only in anterior aspect in about 15 % population it can take a posterior descending course as well . When LAD wants to conquer more areas of heart is it a clinical advantage ? In ideal anatomic /Physiologic conditions LAD should nearly meet the PDA to prevent any water shed area. There is some evidence to suggest the site of ventricular rupture in anterior MI is related to the gap in the LAD/PDA drainage zones. 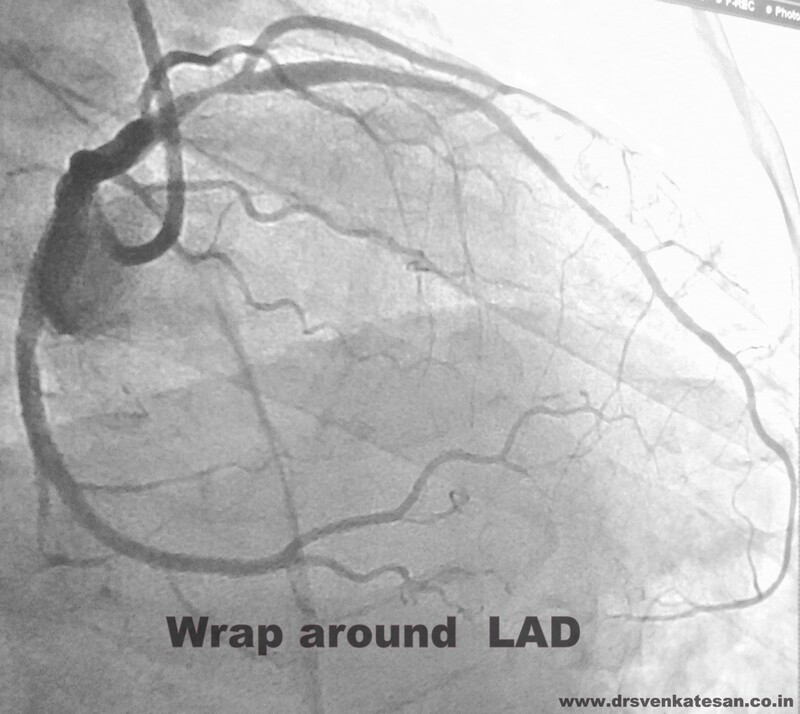 Patients with Type 1 LAD are at risk of LV apical ischemia if the dominant LCX /RCA is not supportive . A long LAD is definitely a hemo-dynamic advantage in physiology , Of course it goes without saying . . . when it’s likely to get obstructed it is always better to have a Type 1 ! Hi Dr Venkatesan, I am currently chasing data on the population with ‘wrap around’ LAD’s for a small research project. Would you have any information pertaining to the percentage of the population with this variant (Type III). I am also just looking at our data. I will report once the collection is complete . But one thing is sure it is more prevalent than we would thinK.